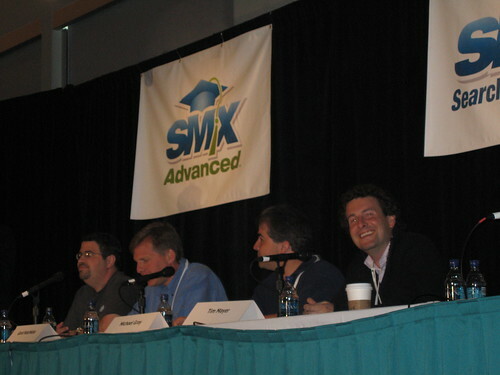 Home > Search Engine Conferences > SMX Advanced 2007 > Personalized Search: Fear or Not? Danny speaks first. He mentions that Google is moderating the results based on users' searching habits. He shows us a screenshot of personalized results. It's not a dramatic change, he says. Someone on the bottom of the page might have slipped off the top 10. This is sucky if you are the site that dropped out. But you shouldn't think that Google reshaped everything; it can get more dramatic over time. Personalization Influencers: - Add to Google button - Google Personalized Homepage Content - Google Bookmarks - Search History (clicks) - Web History (visits) Yahoo! MyWeb lets you go save pages or Block people you don't like. These are signals that Yahoo collects to reshape their results. Ask.com has stuff that is about a year old. They have the ability to save info (put it into folders). It's not working as well as it should but they have rudimentary things that would reshape the results. The overall summary is that Google is doing the personalization. Yahoo and Ask harvest information but have yet to do the same as Google. Google is likely to be more aggressive with personalization over time to reduce spam and deliver more relevant results. Next up is Gord Hotchkiss. Personalization is a new area. We speculated about what SEO and blackhat might look like. The thing about SEO in pre-personalization is that there are keywords and algorithms and everything revolves around keywords. But in personalization, it revolves around users: social pattern, search history, web history, and current tasks would revolve around this. It's very difficult for a marketer to look at an individual user. That becomes very granular. We're going to look at buckets of behavior and work around themes. Themes that fall into common user themes are emphasized instead of keywords. Long tail optimization becomes very interesting. Optimizers will look at the long tail a little bit more where personalization may not be an impact right away. Personalization can really drive a much more presentation of universal search results. If you know more about the user, you're more confident in providing different results to the user. Thus, understanding user behavior is vital. Knowing what people are looking for is critical. User-centric development will finally take hold. You would not believe how many sites are not user-centric. This will really push that. On the black-hat side, emerging "buzz sites" will be an SEO tactic. You can look at the next hot buzz and find out which will build interests. Circles of importance: A handful of sites or specific content will emerge for each "theme." The optimizers will need to identify the circles of importances. These will be inundated for offers for RSS content, widgets, and gadgets. Scraping of content from circles of important sites will also occur as well (blackhat). User intelligence will become more important. - Click stream based intelligence tools - Engines will influence more profiling tools for paid, which will be used by SEO - Social bookmarking sites will become hotter - Personalization enables scaable social search - More use of personas in SEO - More spyware in watching click behavior for blackhats. Now, Michael Gray, aka Graywolf, presents. Unethical SEO tactics: Suggest to all of your clients to sign into personalized search to search for their site so that they can show up in the #1 position. Then you can say "look how great my work is doing!" Fear of uncertainty: different datacenters and geotargeting already create SERPs with varying degrees of differences. Personalized search adds more uncertainty to the issue. PPC might actually work better in terms of stability. SO you can become a Google addict. If you want to take advantage of personalized search, you need to use Google Reader, Google Bookmarks, and all other Google properties. How is Google dumbing down the user? People are assuming that Google knows what they want and will provide results that they want. Then people trust Google too much and use other search engines and services less. I don't recommend that. How do you fix it? Stop hiding that people are logged in in a very obscure part of the screen. Be clearer when the results are personalized search results and are not normal results. Make it easy for people to turn off personalized search. Take advantage of social media sites to get more personalized search results. Tim Mayer is up next. He mentions that he'll discuss how Yahoo looks at personalization and their approach in the social area. Two techniques of search personalization: 1. Session based personalization - understand the intent of the user based on queries and clicks during a specific session. The challenge of this is figuring out when sessions start/end. You might want to search for the Florida Marlins but then you switch to fishing and search for "marlins" again but might get the wrong results. 2. Interest based personalization - Understand the interests of the user based on their own declared preferences or user behavior inside or outside of the search context. The challenge of this is that sometimes users do things outside their normal behavior. If you are searching for Jaguar the car before, but then you got a Mac, your behavior may be not normal. The impact of personalization on search results: - Queries should get shorter: current average is ~2.7 - Example: [library] vs. [boston library] More of the top 10 should be relevant to the user assuming the intent is extrapolated from the query. Personalization's impact on SEO: - Better relevancy: better matching results that show up - Give the search engine enough content per page to help it determine the topicality of that page. Yahoo's Approach - we take a more social approach (delicious, Flickr, Yahoo! Answers). By searching and leveraging this data, we help people discover new forms of information. Discovery and recovery. You can store this data and find it at a later date. Many results are subjective - cool lamps on Google vs. cool lamps on Flickr. People's reputations are on the line on sites like Flickr. There's social incentive for people to help you and tag them appropriately. Finally, Matt Cutts is up last. Personalized search is different for people in different ways. For example, I can go up to Jane and ask her "What's a Kiwi?" Since she's from New Zealand, she's going to say something different. One of the coolest things about personalized search was that once, I was looking to make a vignette on Adobe Illustrator and there are like no search results that are relevant for that finding. A few months later, I needed to find this again. How am I supposed to recall the search terms I use? I can look at my Web History and see what I searched for and what I clicked for. There's a whole new era to optimize in personalized search. SEO won't be the same as before, but personalization is not such a huge change that things will be unrecognizable. This is how you disable personalized search: with 6 characters, you can add this parameter to the end of your search - &pws=0. It's easy to opt out. Greg Linden once had commentary on Personalized News Search and said that he has read that there is a 40-50% improvement on clickthroughs. But his commentary says that there was more of a 200% improvement on clickthroughs. And this is just in Google News. It will be great to explore this space in the future.